Most parents can imagine the backstory to this photo. Someone heard the word “no.” Perhaps a behavior correction or maybe a request was denied. 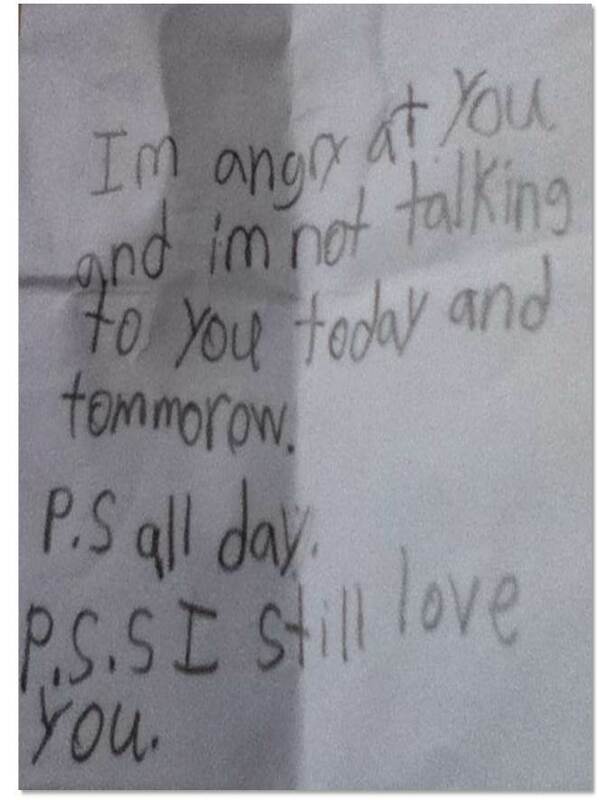 The result was anger and anger must have its retaliation; communication between parent and child is suspended. Not only that, but the anger is big enough for a two day suspension. That’s a big anger right there. A note like this makes us smile – especially if you are a busy parent and think two days of suspended conversation might be less of a punishment than what this child expects. I remember those days. Here is a child who understands how unconditional love works. This brand of love is not an “if, then” love that waits until conditions are met. It is not a “because” love that attaches itself to a characteristic of the receiver. Instead it is an “anyway,” “even though,” and “in spite of” kind of love that continues on no matter what. This is the kind of love we receive from our Heavenly Father and it is the kind of love that children need in order to grow, learn, and become resilient. They need to know that they are loved even when they fail, even when they are disappointed, even when they hear “no.” They need to know that love continues. Unconditional love creates a safety net that allows children to take risks, fail, and learn from mistakes. It is a love that offers forgiveness and learning. It is a love that sustains during difficult situations.